Empirical experiments have shown that storing every case does not automatically improve the accuracy of a CBR system. Therefore, several retain policies have been proposed in order to select which cases to retain. However, all the research done in case retention strategies is done in centralized CBR systems. We focus on multiagent CBR systems, where each agent has a local case base, and where each agent can interact with other agents in the system to solve problems in a collaborative way. We propose several case retention strategies that directly deal with the issue of being in a multiagent CBR system. 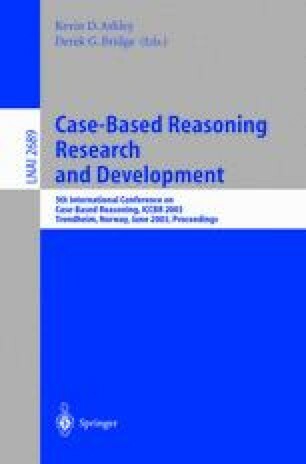 Those case retention strategies combine ideas from the CBR case retain strategies and from the active learning techniques. Empirical results show that strategies that use collaboration with other agents outperform those strategies where the agents work in isolation. We present experiments in two di.erent scenarios, the first one allowing multiple copies of one case and the second one only allowing one copy of each case. Although it may seem counterintuitive, we show and explain why not allowing multiple copies of each case achieves better results.